Pamela Jean Godwin Sherley, daughter of William C. 'Bud' Godwin and Ida Mae Watson, married to Johnny Edward Sherley and will be buried in a private burial at the Sherley Family Cemetery. 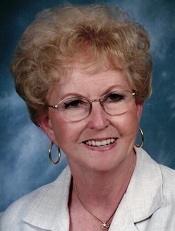 Beginning in the 1971-1972 Jim Ned school year, Jean was elected the first female school board member on the Jim Ned Consolidated Independent School District Board of Education. Pamela (Jean) Sherley passed away on September 5, 2016 surrounded by her family. She was born in Santa Anna, TX on October 29, 1934, the youngest child of Bud and Ida Mae Godwin. She grew up in Albany, Texas and graduated from Albany High School. She married Johnny Sherley on October 3, 1953. They began their almost 62 years of marriage in Albany where their three children were born. They soon moved to Lawn where they raised their son, Bucky, and two daughters, Kathy and Carolyn. Jean had an entrepreneurs’ spirit and worked hard to help support her family. She owned a dress shop and beauty shop in Lawn, a video rental store in Tuscola, Tan-Chance beauty shop and florist in Tuscola and, after earning her real estate license, worked as an agent in Tuscola and later for Nelson Farm and Ranch in Abilene. She continued working as long as her health allowed, completing the requirements to renew her real estate license a month before her death. She also served on the Jim Ned CISD Board of Trustees as its first female member. She enjoyed working in her yard and in her wood shop, she often used her skills to create elaborate decorations to make the holidays special for her family and the community. Most of all, Jean loved her family. She was happiest when all her children and grandchildren gathered at their home for the holidays or just for Sunday lunch. She is survived by her husband, Johnny Sherley of Lawn; son, Bucky Sherley of Lawn; two daughters, Kathy LeFevre and husband Kent of Tuscola, and Carolyn Golson and husband Glenn of Lawn; a sister, Wanda Farmer of Albany; grandchildren Tanner Sherley and wife Amanda, Chancey Golson and wife Barbara, Dani Golson, Kit LeFevre and wife Megan, Colter Sherley and fiancée Whitney, two great-grandsons, and four nephews. Visitation will be on Wednesday, September 7th at Fry-Smith Funeral Home in Tuscola from 5 to 7 pm. Funeral services will be on Thursday, September 8th at Lawn Baptist Church at 2:00 pm. A private burial service will follow at the Sherley Family Cemetery, directed by Fry-Smith Funeral Home, Tuscola. In lieu of flowers, the family requests that memorials be made to “On the Way Home Ministry” PO Box 266, Lawn, Tx 79530. Pallbearers are Tanner Sherley, Chancey Golson, Kit LeFevre, Colter Sherley, James Beauchamp and John Beauchamp. Honorary pallbearers are Danielle Golson, Bob Farmer, and Jim Farmer.